Our staff offers years of flooring experience and knowledge not often found in large national chain stores and 800-toll-free companies. Because we are locally owned, we can assist you with making the appropriate flooring decision for your home or business to ensure your satisfaction for years to come. 1973 - The Colonial Carpet Shop, Inc.
We support several non-profit groups and organizations in our local community. "To excel in every aspect of our customers’ expectations through the three most valuable assets in our business: Service, Service, and Service." • Does This Sound Familiar? • Our Interview with "Connecticut For Sale"
Sale of remnants and clearance items are final. No refunds, no credits, no warranties apply. Cut-to-length materials (i.e. carpeting, sheet vinyl, pad/cushion), “Cash & Carry” and “Special Orders” cannot be cancelled. No refunds or credits will be issued. All sales are final. On non-special orders installed either by Colonial Flooring America, the purchaser, or a third party, the return of unopened cases/cartons of material is subject to a minimum of 25% re-stocking fee based on the purchase price. A minimum of five (5) cartons/cases can be returned. Purchaser is responsible for all freight charges on returns. 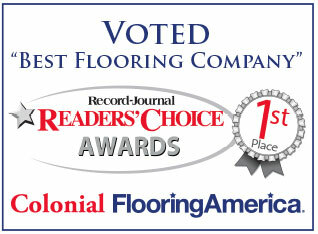 Refund will be issued once the distributor/manufacturer has inspected the merchandise and issue a corresponding credit to Colonial Flooring America.